I started making mulberry granola by accident! You see I'd set out to make flapjacks, but the recipe went disastrously wrong. I'd forgotten to add mashed up banana and grated apple, which were binding agents in a very healthy flapjack recipe that I make for Emi, my son, from time to time. There was an ominous smell of burning that ought to have had me running to the oven to check things out, but I was busy multi-tasking and didn't manage to tear myself away from whatever I was doing in the other room. As a result, when I finally opened the door I was faced with something that was much too crumbly to cut, and that wouldn't hold together in the way in which a flapjack ought to. So I nibbled a bit, and it didn't taste too bad. I looked at the mess, scratched my head and wondered if there was anything I could do to salvage the situation. All that luxurious dried fruit seemed too rich to feed to the wild birds. After a moment's thought it occurred to me that my tray full of crumbs looked a bit like a slightly overcooked granola mix. Bingo! Eureka! That was it. I'd inadvertently made granola! 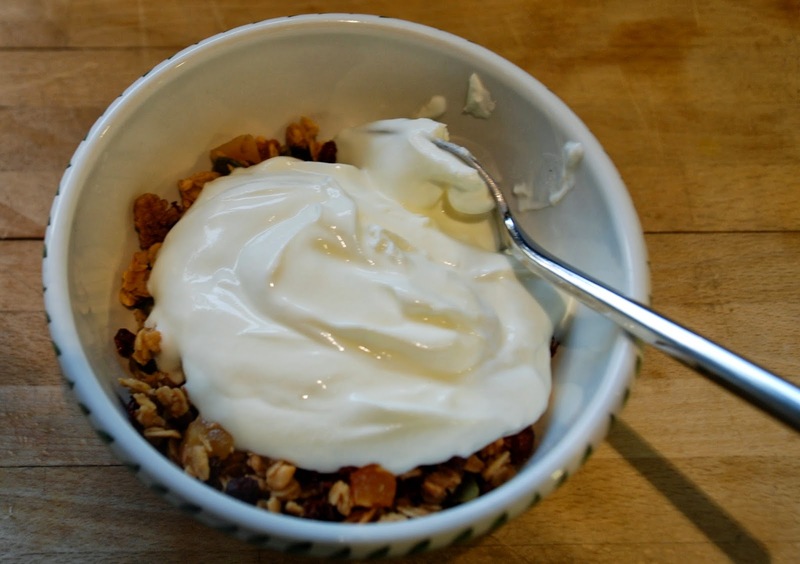 I tried it with a few spoonfuls of Greek yoghurt and it wasn't half bad. It wasn't perfect as I'd burnt it slightly, but with a bit of tweaking I reckoned I could make something really tasty next time round. And that was how my granola recipe was born: by pulling victory out of the jaws of defeat! Anyway, enough of telling stories. Here's what you need, and here's how to go about it if you'd like to give it a try. 200 g/ 7 oz of mixed dried fruit. This is what I added today, starting from top left and going clockwise: 40g barberries, 40g apricots, 40 g papaya, 40g mulberries, and 40 g golden sultanas. Mix the rolled oats, dried fruit and seeds together to get an even, uniform mix. 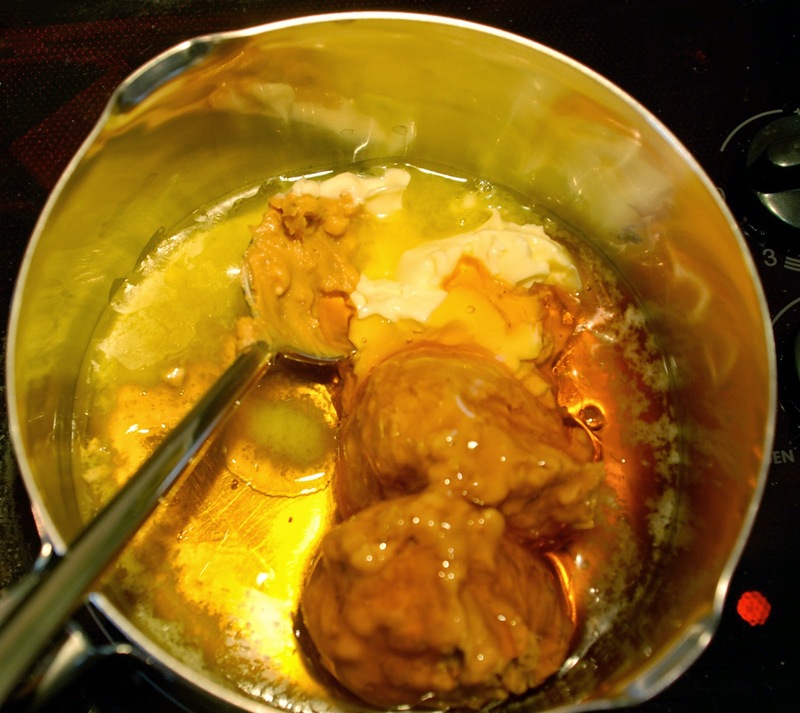 Melt the butter in a saucepan over a low heat with the peanut butter and the syrup. Stir well to get a smooth, uniform liquid. Add the melted butter/ peanut butter and syrup to the oat mixture and stir well so that the oats are evenly coated by the butter mixture. Line a baking tray with a sheet of baking paper and tip the oat mixture onto it, spreading it out so that it is evenly distributed in a thin layer on the tray. Bake in the oven for 35 to 40 minutes until golden and crispy. I was running around with no time to do anything last week and had to eat some store-bought granola. It cost me three times as much and wasn't a patch on this scrumptious stuff.